Certain parties *cough*Adrienne*cough* felt that the previous dress didn’t provide enough rainbow. So I’ve perhaps gone a little too far in the other direction? Well… maybe just a little! It’s somewhat goofy, but some nights that’s not so bad. Rainbows are definitely good! I love the subtle curlicue patten all over. It’s totally awesome! it looks kinda like something under a heat monitor. Well, if someone was gay this would be their wedding dress. But I personally really love it, especially the green. It’s gorgeous, and you always continue to impress all of us, Liana! I would totally wear this to a costume party. Maybe with a cool mask! I really did like Kate’s wedding gown, but the lace sleeves mean I can’t really draw it such that it’d work on both of the dolls. It was gorgeous though! It’s so…I cant even find words to describe this! It reminds me of a very colorful fire, if that makes any since. Well anyway I really love this gown! Joke dress or not, there are no words in the English language adequate to describe how utterly awesome this is. ACID TRIP RAINBOW FLAME EXPLOSION DRESS. I need this so I can wear it to work. Re: The royal wedding dress, maybe you could draw one version and colorize it, thus to have a version for each doll? It’s so pretty! It looks kind of 80s-ish, if that counts as a compliment. I love the colors and the curved designs, it’s so beautiful! why not do a b/w version of the wedding dress, and then color them both differently? You simply HAVE to do that dress, Liana! I literally screamed in delight when I saw it! The other’s rainbow accents were fine! But…this! It’s like an artist I’ve seen, who splatters paint on it creatively. It’s just so creative and fabulous! You’re a designer and an artist, Liana! 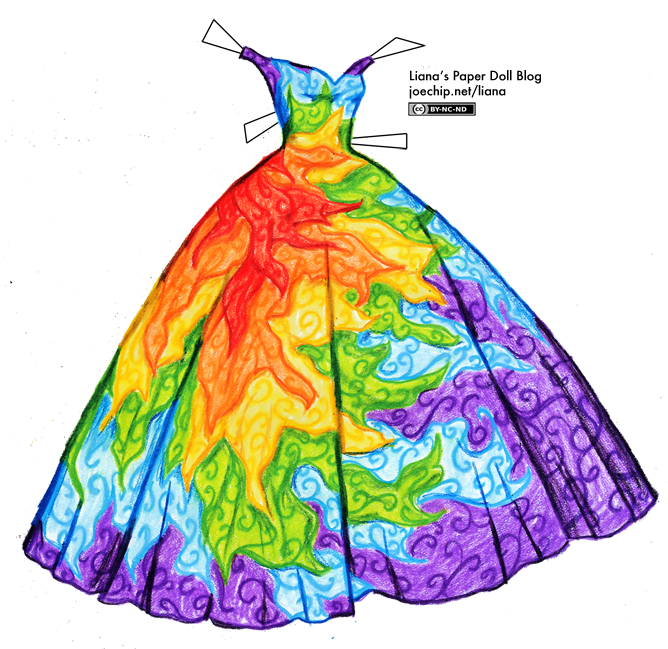 I LOVE this dress – I wish i could actually make it for my niece, she’s in love with rainbows and needs an awesome prom dress for her senior year… :) Yet again you outdo yourself and it’s wonderful! LIANA! today was the Royal wedding :) are you going to make Kate Middleton’s dress? ? could you make a lord of the rings dress??? maybe an eowyn dress??? Oh my gosh it’s like a rainbow on acid exploded! That’s supposed to be a compliment, I love it! can u post the tutorial for the mermaid thing and color the black and white ball gown you just drew not very long ago? I love how the colors accent the shapes and curves of the ‘rainbow explosion’ and the design inside the color shape. BEAUTIFUL as almost all of your dresses are. Some just don’t catch my interest (Or maybe the lack of fantasy I know I love to read and write. I actually need help envisioning dresses themed by water, fire, earth, and lightning; and not your cursed Linetta dresses, but casual peasant-style dresses with flowing skirts and long, swooping sleeves.The water one with abalone shells, aquamarine, and silver; the fire with fierce rubies, onyx, and gold; the lightning with amethest, lightning bolts, and gold; and the earth with bronze,emerald, and ivy vines. That’s all I know about them so far, and I just need inspiration to describe them in my book. I’m in no hurry, as I need to get past chapter one. :) It woild really help me if you could do these for me Liana.) By the way, did you go to art school? Thanks, but I need tons more detail for my book and I just can’t picture it at all.